Parkinson’s disease (PD) is defined as a movement disorder, characterized by a symptomatic phase of motor disturbances such as tremor and slow movements resulting from the severe degeneration of dopaminergic neurons of the substantia nigra pars compacta (SNpc). Recently, it is recognized that Parkinson’s disease is also a multisystem disorder characterized by a wide range of non-motor symptoms including gastrointestinal (GI) dysfunctions such as delayed gastric emptying and severe constipation. In many patients, GI symptoms appear up to 20 years prior to clinical PD diagnosis. While it is recognized that PD is a chronic and progressive disorder, its triggering factors are still under debate, however it is accepted that the majority of PD cases are idiopathic and may result from exposure to toxic environmental factors. The hallmark of PD, including idiopathic PD (iPD), is the presence of aggregations of misfolded a-synuclein in affected neurons, such as those of the SNpc. Several studies have shown that, in parkinsonian patients, a-synuclein depositions can be identified in temporal stages, starting from the enteric nervous system (ENS) in the GI tract and progressing to the central nervous system via neural pathways. Based on this progression of the parkinsonian pathology and the prodromal GI dysfunctions, Braak’s group postulated that one of the causes of iPD could be the entry of a neurotropic pathogen into the GI tract, and the subsequent formation of misfolded α-synuclein and its retrograde transport to the first GI-related area in the central nervous system, i.e. the dorsal motor nucleus of the vagus (DMV). The deposition of misfolded α-synuclein in the ENS and DMV would account for some of the GI dysfunctions, such as delayed gastric emptying, typical of PD patients. The question addressed in our study was to test the hypothesis that there is a direct anatomical connection between the DMV and the SNpc. Proving the existence of this neural pathway may explain the progression of misfolded α-synuclein and parkinsonian pathologies from the gut to the SNpc. Upon injection of neuronal tracers in the SNpc or DMV of rats, we discovered the presence of a direct anatomical connection between these two areas. We then assessed the physiological relevance of this neural pathway via a series of experiments in which we recorded gastric motility and tone, representative of gastric emptying in an experimental setting. We discovered that excitation of SNpc neurons increased gastric motility and tone. This effect was determined by the release of dopamine onto DMV neurons and the activation of vagal pathways. Conversely, optogenetic inhibition of the SNpc fiber terminals that project to DMV neurons resulted in a decrease in tone and motility, both at baseline and also after pharmacological stimulation of the SNpc. These data provided a strong indication that this pathway between SNpc and DMV is direct, is tonically active, and is physiologically relevant. Finally, using i.p. injections of the herbicide paraquat to induce a well-recognized model of PD, we showed that this neural pathway is compromised before the full development of motor dysfunctions. 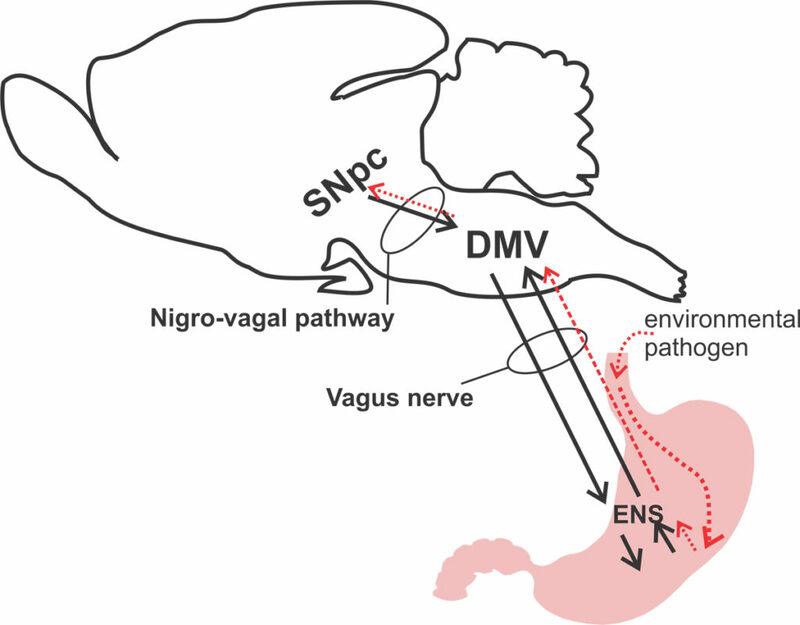 In summary, we discovered a novel nigro-vagal pathway that can be a conduit for the direct retrograde transport of ingested neurotoxicants and/or α-synucleopathy from DMV to the SNpc neurons, thus triggering the prodromal GI dysfunction observed in PD. A Nigro-Vagal Pathway Controls Gastric Motility and Is Affected in a Rat Model of Parkinsonism.